Danielle Flinders (Alicia Vikander) is a biologist preparing to descend to the bottom of the ocean in an experimental submersible. Despite it being the most important moment of her career – not to mention the most dangerous – she remains haunted by a truncated romance she had the previous year with a man named James Moore (James McAvoy). She is desperate to know why James cut off contact without warning, not realising he is a prisoner of Islamic extremists in East Africa. Submergence is an adaptation of the J.M. Ledgard novel of the same name, adapted by Erin Dignam and directed by Wim Wenders. It has a strong cast and some beautiful photography. It is also terrible. The film is let down by a leaden and poorly interconnected story, and a false sense of importance that makes it sound profound while trading in simplistic inanities. I have not seen all of Wim Wenders’ films, but it is hard to imagine based on what I have seen that he has even made a worse film than this. The lead performances by Vikander and McAvoy – two sensational contemporary actors – save it from being actively unwatchable, but it certainly winds up being jaw-droppingly disappointing and ordinary. The film essentially attempts to take two very different people, link them together romantically, and then link them a second time by contrasting their experiences for the remainder of the film. One is a biologist attempting to take samples from the bottom of the ocean to demonstrate a portentous theory of life’s origins. The other is a British secret agent masquerading as a well driller in Africa. While the overly self-conscious dialogue does its best to somehow join those lives together, it fails terribly. The result is a superficial spy drama that fails to deliver any genuine insight, shuffled into an underwhelming drama about a scientific expedition. The bulk of the running time is occupied by James’ experience as a hostage: facing death, suffering torture, and unsuccessfully challenging his captors’ political views. It is only in the last few minutes of the film that we get to Danielle’s story, which plays out almost as an afterthought. There is something insidiously sexist about how each protagonist behaves. James remains a strong man of action, while Danielle mopes for two hours. For much of the film there is the sense that it’s creative success will ultimately rise or fall based on how it ties the two narratives back together – it simply fails to do so. It is only early flashbacks to the lovers’ initial romance that satisfies, and that is because it is a simple sequence that relies primarily on Vikander and McAvoy’s mutual chemistry. The actors successfully sell a believable attraction between the two of them that at least establishes a viable movie. It is only once the film moves on to attempt tackling Islamic extremism in a similarly superficial fashion that the facade begins to crumble away. By the end it is all sound and fury and false reverence, and Wenders mishandles the conclusion dreadfully. 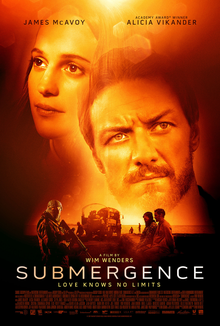 In the end Submergence is mildly enjoyable for fans of its lead, as well as those of former Star Trek star Alexander Siddig in a promising but ultimately aimless role as a terrorist camp doctor. For anybody else it’s a waste of time – and that includes the cast and crew.